GREENE TEAM: First-year head coach Scott Greene (center) and staff—offensive coordinator Mike Foster, offensive line coach Jason Andersen, and defensive coordinator Nick Grange—lead the Yellowjackets this fall into Fauver Stadium. The football team will play on a new, more grass-like artificial surface called Field Turf that was installed this summer. With a new head coach and a reinvigorated outlook, members of the Yellowjacket football team say fans can expect big things in 2006. “They’ve brought a winning attitude, and they have a record to back it up,” says cocaptain Nick Zappia ’07, a first-team academic All-American in 2005, of the new coaching staff. 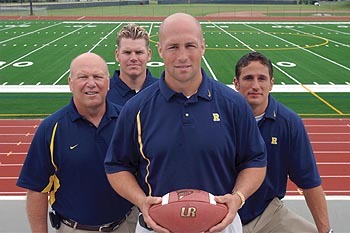 At the forefront of what many hope could be a revitalization of the football program is new head coach Scott Greene. He took over for Mark Kreydt who stepped down after the 2005 season to enter private business. Greene, who was promoted from linebackers and special teams coach to the head job in May, has never served as a head coach before, but he has an impressive résumé. Named the New York State high school Player of the Year while starring at Canandaigua Academy, Greene excelled collegiately at Michigan State before playing four years in the NFL. After last year’s 4–6 record, Greene says 2006 will be different because the players have invested themselves in the team’s success. Rochester fans, he says, will see something special. “They’re going to see dedicated football players who want to win, who want to compete on every down,” Greene says. As soon as he took the top job, Greene tried to instill an attitude of accountability on the part of the players and the coaching staff. Players were asked to commit to grueling summer workouts and report to Greene on their progress. Team cocaptain Patrick Gallagher ’07 says Greene’s high standards and positive attitude quickly had an effect on the team. On offense, that talent includes tailback Matt Bielecki ’08 and quarterback Aaron Molisani ’07, who are being counted on to lead a more ground-based attack devised by new offensive coordinator Mike Foster, Greene’s high-school coach at Canandaigua. On defense, Greene says he’ll rely on defensive coordinator Nick Grange to lead a unit that will largely retain last year’s scheme. All in all, Zappia says, Yellowjacket supporters will be treated to a show on both sides of the ball. The wins, however, won’t be easy. The Yellowjackets’ 10-game schedule, which begins September 2 at Johns Hopkins, features no sure things. An early highlight will be the September 9 crosstown showdown with St. John Fisher in the second annual Courage Bowl, which Greene and his players have been anticipating all summer. However, while Greene is expecting good things on the field, he also knows what comes first for Rochester football players. Greene is using the University’s strong academic reputation as a recruiting tool; he says he and his staff are especially focusing on attracting the best high-school talent from the Rochester area. He’s also hoping to appeal to recruits by assuring them that good things are on the horizon for the program.